And if you're called upon to clean the junk off a friend or relative's PC this Easter break, you might want to share this link with them to save you getting called back out again in a week. Threatfire is designed to work alongside existing security products. 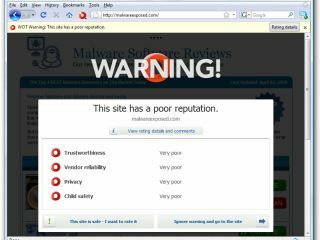 Unlike traditional anti-virus tools, it doesn't rely on signatures to identify malware; instead, it monitors your PC for suspicious malware-like behaviour. The only time you'll hear from the program is when it's found something suspicious; otherwise it'll sit silently in the background. HTML can be used to hide all sorts of unpleasant things in email. Set your mail program to view all messages as plain text by default - you should see an option for viewing individual messages as HTML when you trust the sender. Never visit web sites by clicking links in your email unless you're 100 per cent sure the link is safe. This is especially true for emails purporting to come from financial institutions asking you to log in to verify your account details - 99.9% are scams (the other 0.1% are irresponsible). Most anti-spam tools only process email that's been downloaded from your mail server - install PopTray and you can check and preview your mail while it's still on the server, deleting unwanted and suspicious messages without exposing them to your mail program. Upgrade to the latest version of Internet Explorer or switch to a browser that doesn't support potentially malicious Active-X controls such as Firefox, Opera or Google Chrome. Check the browser's privacy and security settings are set to Medium High or greater. Install the free Web of Trust plug-in for Internet Explorer or Firefox (Chrome will be supported once the browser supports third-party add-ons), and you'll be in a better position to avoid unsafe web sites thanks to its traffic-light system for both sites and search engine results. A password manager such as KeePass enables you to securely and easily enter your passwords into any program. As you only need to remember one master password to use the program, there's no excuse to use the same password across all your online accounts (the program will even generate secure, random passwords for you). Never open attachments or downloads directly - save the file to your hard drive, right-click it and run a quick scan with your security tool of choice prior to opening it. When downloading files, make sure you download from a reputable web site (typically the program's own home page or a respected download site) – the WOT plug-in will help here. Peer-to-peer networks are a breeding ground for malicious software, particularly in content that's been copyrighted. If you can't live without P2P, pick a trusted provider and client (such as uTorrent). Be careful what you share, and scan all downloads prior to opening them.